The water temps at kipto revived to 44 this past week, but not long enough to get the fish biting. Then another cold front slammed in and really put some cold air in the area which dropped the water temps. I heard of fish off of sandbridge before this front hit. The stripers should be far south or far east by now. The bite became real consistent around the current changes this week. With multiple fish caught instead of one per change. The best day was Friday before the nor'easter blew through. The sky was overcast, the wind was light, the water temps were right, and the pre-dawn air was frigged as I paddled out for the morning slack. I hung out with Rob Choi and waited for the zip-zip from my line. As the color of the sunrise crept over the shore line I got a zip-zip and yanked a 43"er from the pilings. At daylight, Rob dropped on the ship and hooked up to a 45"er that pulled him out and back to the ships. I was adrift out from the ships after taking pictures of Rob when I felt a hard tap from the eel I had dangling. I picked it up and fish on! Awesome, except for my reel was broken and reversing. I fought the 45"er holding on to the handle and letting line out on runs by reeling backward. Afterward I had to come in to harm my hands and Rob went on the drift. I came back out for the mid-day slack current. I made a ship-rip drift close by and ended by the southern ships. At the slack the fish woke up, I saw one fought at the pilings, one the ship drift, and Charlie church landed a big one on the ships which he promptly took to Chris's bait and tackle to weigh. It was a beast and I think it weighed in at 47lbs. After another break I headed out with Ric for the evening slack, it was our last chance before the storm, and the winds were already picking up. We fished into the rain, I hooked a good sized one but didn't back my drag off after the hook up, and broke my 50lb braid on a lunging head shake. I sat there looking at my line and said "I never knew I could do that." luckily I got another shot and hooked a 48"er that really liked to be beside the ship wall after a run outside. On our last day we fished the morning and the evening current change, nothing in the morning and one in the evening. Chad Hoover was in the middle of everyone and hooked up to a 51�er check it out at kayakbassfishing.com. That was it for that change, facing defeat Shante decided we would have to hit the late night current change. The wind picked up from the southwest as we launched. We hid behind the ship until we heard cussing from the pilings from one that just got off. We tightened our boot straps and headed out into the mess. The waves had us pitching 2 feet as we hovered constantly paddling into the wind. I hooked into a 44�er and didn�t re-eel as I knew Shante was going to hook up in min�s. She did but it came unbuttoned during the fight. She was a littler frustrated but dropped again. The next one she hooked solidly, fighting it with tight drag, only giving inches of line. At the side of the boat she didn�t even bother with lipping it she scooped the 45�er in with only leg and leader. The eastern shore will let you know when you have given enough to the fishery to let you land a fish, whether it is money, fishing rods, loads of tackle, cell phones, and paddles, what ever you can lose to the water is payment to land a trophy fish. The e-shore is a due paying fishery. But you never know who might just get lucky. Lee and I thought is was going to be a calm wind day so we headed out for the drift. The current was ripping in so we thought we�d drift out and come back with the outgoing current, which would be noonish. The wind came up hard from the north and we wanted to get back to the shelter of the ships. We paddled against the strong current only making headway with the waves as they pushed us against the current. It took us two hours to paddle the two miles. Here�s where the luck come in to play. We work our way in the alleys to one occupied buy a few guys who had been there for a while. Lee dropped an eel along the ship wall and hooked up to a 48�er, his first big kayak caught fish of the year. 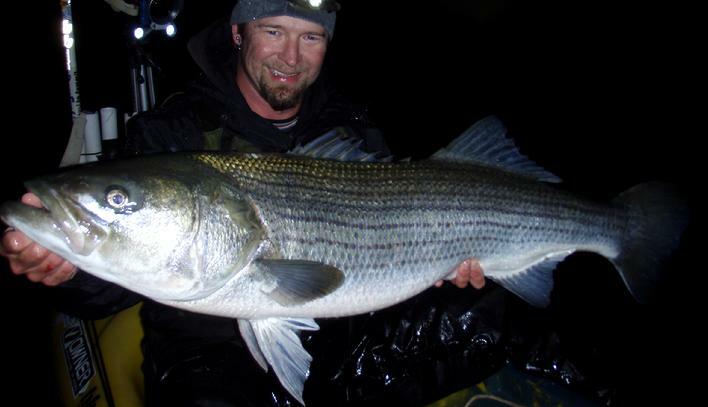 My 1st big striper of the year, 46"
The water temps were almost in the striper zone earlier in the week and I headed for kipto. I had 54-55 degrees as I slow trolled around kipto. My eel didn't even get nervous. I finished the evening at the ships for the current change with no runs. Al Stillman from Kayak Fishing Magazine online rented a kipto lodge with a group of friends this weekend. I meet them out at the ships for the night tide change. Two of them landed striper. � Copyright 2007-2011 Kayakkevin.com Productions. All rights reserved.